Summer Jamboree is back, bringing you the most exciting International Festival of music and culture from the U.S.A. of the 1940s and 1950s and making the streets and beaches of beautiful Senigallia even hotter. 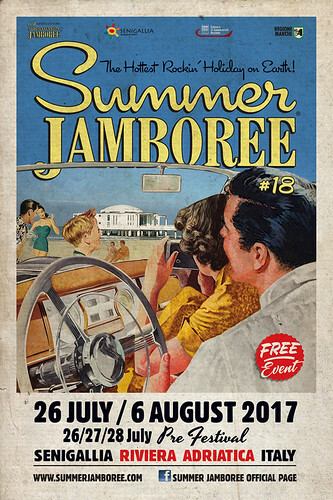 With three days of pre-festival as the news of the season, this year you will have 12 days of Summer Jamboree to lose yourself in vintage music and fashion. You are invited to: dance with us to the music of specialized dj sets from midday to night, learn to swing and rock 'n' roll, eat exquisite Cajun & Tex Mex Diner and get yourself an old-style haircut at the Barber Shop. Even more importantly, everyday from 5 pm to 1 am, you will be so lucky to shop at the big Vintage Market in the Rockin' Village. As usual, A.N.G.E.L.O. Vintage Palace will be on the front line with a customized selection of extraordinary vintage clothing. We are already in the mood for the hottest festival of the season, and you?